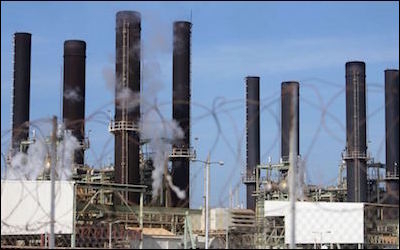 The West Bank-based Palestinian Authority (PA) has stopped subsidizing electricity in Gaza; a senior PA official said last month that the reduction is intended to "dry up Hamas' financial resources." Accordingly, the Israelis will cut their supply of electricity to Gaza by 40%. The Hamas leadership in Gaza has threatened Israel with "an explosion" if it does not supply electricity to Gaza at the expense of Israeli taxpayers. Blackmail is, of course, part of the Hamas repertoire. One of the main reasons why Hamas launched thousands of rockets and sent terrorists into Israel via tunnel in the summer of 2014 was to solve its dire economic problem. Hamas needs electricity to build terror tunnels and produce weapons. Voices in Israel and abroad are advocating "moderation" – meaning capitulation – and insisting that Israel has no interest in an escalation. While Israel naturally prefers quiet along its borders, giving in to Hamas demands and granting it a victory will only lead to further demands. Supplying electricity to Gaza in exchange for a promise that Gazans refrain from shooting at Israeli civilians is no different from paying protection money to the Mafia. There is no strategic or moral reason why Israel should supply free electricity to Gaza. Supplying electricity to Hamas in exchange for quiet is like paying protection money to the Mafia. While Israel does not desire escalation, it has no reason to fear it. Israel is the stronger side. Moreover, the essence of war is a competition to inflict pain on the opponent in order to change patterns of behavior. Pain has a positive value in that it affects the learning curves of the warring sides. Israel has made use of force to teach the Palestinians that aggression against Israel does not pay, and that continued support for Hamas can be costly. Another round of violence – one that exacts a high cost from Hamas and the Gazans – may lead them to more peaceful behavior. It is true that it is difficult to influence the learning processes of large collectives, but it is by no means unprecedented. For example, it took much suffering in WWI and WWII to transform Germany into a less militaristic and belligerent society. While not politically correct, such treatment might help turn the Palestinians into peaceful neighbors in the long run. In any case, it makes no strategic sense to ease the situation of Hamas at just the moment that the Arab Sunni states have put Qatar (the backer of the Muslim Brotherhood, of which Hamas is a part) under diplomatic and economic siege. Moreover, the US seems to support the steps taken by Saudi Arabia and its allies. The Palestinian Authority (PA) itself, which initiated the electricity crisis by refusing to continue to pay for energy supply to Gaza as part of the internal Palestinian struggle for dominance, is unimpressed by warnings of an impending human disaster. What moral justification compels Israelis to assist people who support an organization intent on destroying them? Hamas exploits the suffering of Gazans to extract humanitarian aid and sympathy for their cause. But the Gazans cannot be exempted from responsibility for the consequences of Hamas's actions. Unfortunately, Hamas remains popular in Gaza, and all polls show that Gazans support continued violence against Israel. The Gazans are, in short, not good neighbors, and they do not deserve Israel's sympathy. What moral justification exists that compels Israelis to assist people who support an organization intent on destroying them? Moreover, plans to ease the economic situation in Gaza – either by supplying electricity and water or by building a port – send the wrong signals. They tell the Palestinians that their leadership can make grave mistakes, but outsiders with good intentions will bail them out. They also signal to Hamas that it might as well continue shooting at Israel. Why not? If Israel takes military steps in response, merciful donors will repair the damage yet again. Easing the economic situation in Gaza sends the wrong signals to its inhabitants. The billions of euros transferred to the Palestinians over the past two decades have been squandered through ineptitude and misappropriated through corruption. Like many Third World countries, Gaza lacks the legal and institutional infrastructure needed for the effective dispersal of economic aid. Very little aid has filtered down to the people. Hamas leadership, however, continues to be enriched by it. Those with arms always get the first and best cut of foreign aid sent to the poor. Humanitarian aid to Gaza is also siphoned off to build better military capabilities with which to fight Israel. The authoritarian rule of Hamas dooms the Gazans to continuous poverty, ignorance, and protracted war with Israel. Palestinians, particularly in Gaza, are not educated to seek peace, but to make sacrifices and martyr themselves in a holy war against the Jewish state. Israel has no choice but to reject Hamas demands, even if that refusal brings about another round of violence that will add to the suffering in Gaza. Even the friends of the Palestinian national movement should realize that it is time for some tough love for Gaza. Maybe a bit of darkness will help the Gazans see the light. Efraim Inbar, professor emeritus of political studies at Bar-Ilan University and former director of the Begin-Sadat Center for Strategic Studies (1991-2016), is a Shillman-Ginsburg fellow at the Middle East Forum.